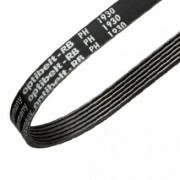 We carry on the shelf the Optibelt rage of Poly-V belts. They are available in L, J & M section and they can be cut to the exact number of ribs that you require. Poly-V Pulley and Belt drives are ideal where you have space restrictions, high ratio or high torque drives. With only one belt, tensioning is easy and you do not have to worry about matching belts. They will also run quieter than timing pulley and chain drives and do not slip like standard V-Pulleys.